As an exclusive Caterpillar dealer, Eneria offers a unique range of static and dynamic UPS. 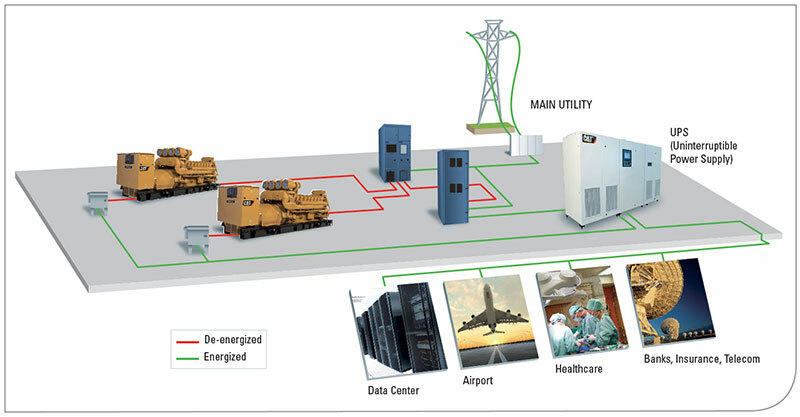 A UPS (Uninterruptable Power Supply) makes sure the time between an interruption of the net and the startup of the emergency generator is covered. Besides that, the system also works as an active filter to guarantee quality power supply. Whether there are micro interruptions of a total electricity black out, the UPS makes sure your production our the services of your company stay guaranteed no matter what. Advice: constraints and feasibility study, developing the design, managing the project, drawing up a financing plan, engineering service, etc. Onsite installation, start-up, user training, grid hookup, etc. Maintenance, urgent servicing, verification of performance, etc.